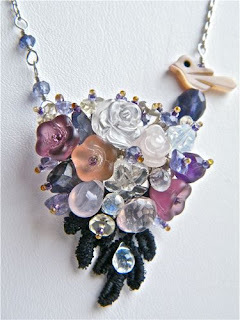 This is A Happy Spring Necklace with lots of beautiful Gemstones. 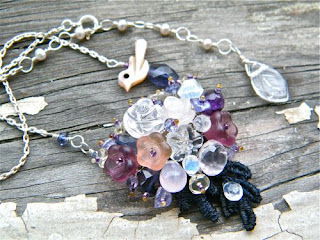 This bouquet is bundled with Vintage flower shaped button, Rainbow Moon Stone, Rose Quartz, Clear Quartz, Green Garnet, Amethyst, Iolite, Tanzanite and pretty Czech Glass Beads. It comes with 16 inch Sterling Silver Necklace with 1.5 inch fresh water pearl adjuster for beautiful finish.